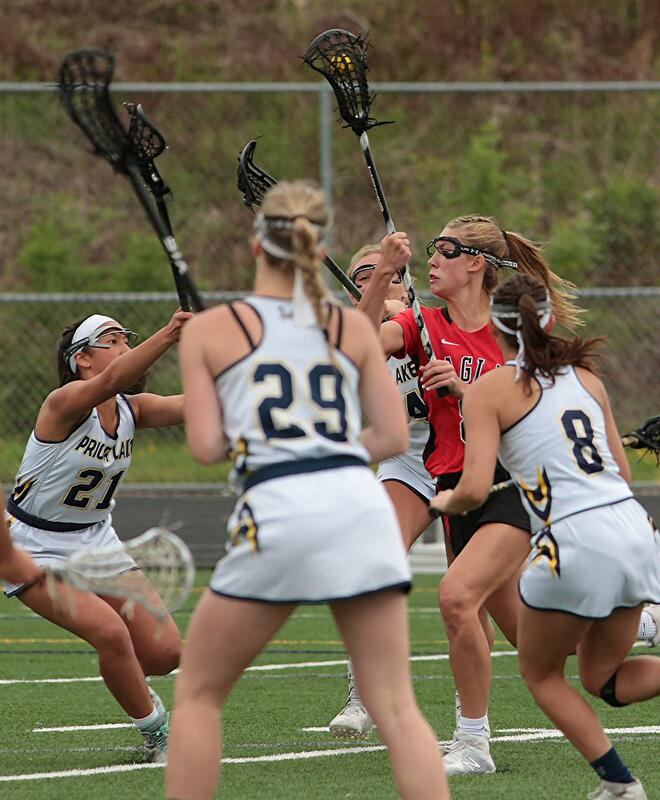 Eden Prairie girls’ lacrosse hadn’t lost a match against a Minnesota team since 2014, when the Eagles fell to Blake in the state championship game. After that loss, they went unbeaten for more than three seasons with the Eagles winning three consecutive state titles in that span. Their only losses came in the regular season against Loyola Academy, a prestigious Midwest program from Chicago. That all changed on Saturday afternoon for the Eagles, who are ranked No. 1 in the state coaches’ poll. In front of its home crowd, No. 2 Prior Lake ended Eden Prairie’s (10-2, 8-0) historic run, beating the defending state champion 6-5. When the final buzzer sounded, the Lakers bench cleared as the team stormed the field. Prior Lake’s Lauren Wick, a junior, said this is a huge accomplishment for her team. She has been working for moments like this her entire career. 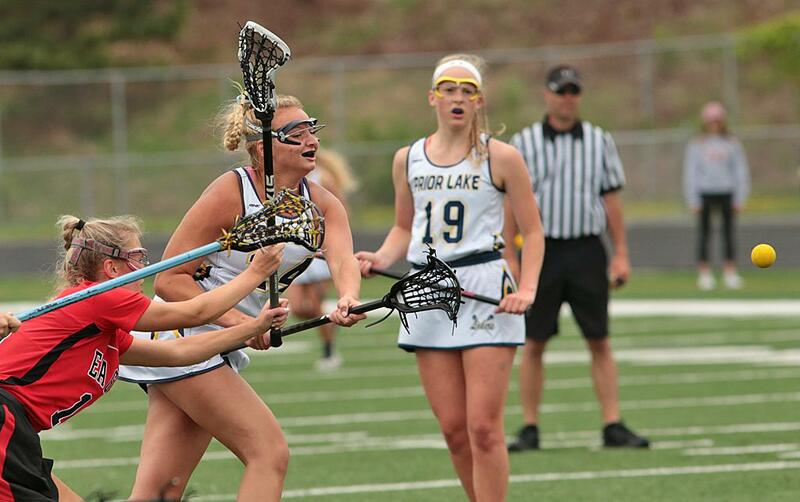 Prior Lake (11-0, 7-0) put on an impressive display in the second half. After conceding the first two goals of the second half, the Lakers scored five in a row to go up 6-4. Wick contributed two goals and an assist during that scoring run. Prior Lake coach Heather Pierson said a change in her team’s mentality from last season to this season was a big factor in how they came ready to play the top team. Eden Prairie co-head coach Judy Baxter said the biggest challenge her team now faces will be how they respond to this defeat. A lot of her players have been on the team since the winning streak began. Baxter said she believes this game presents them with a great opportunity they haven’t come across in years. Pierson said winning this game almost feels like they won a state championship. The Lakers are celebrating now, but Wick knows there is more work to be done to prepare for the postseason. “We know they are going to be coming back harder than ever, so we need to keep preparing just the same as them and even harder. We know they are going to be coming out for us in the state championship, so we need to bring the same effort that we did today,” Wick said. 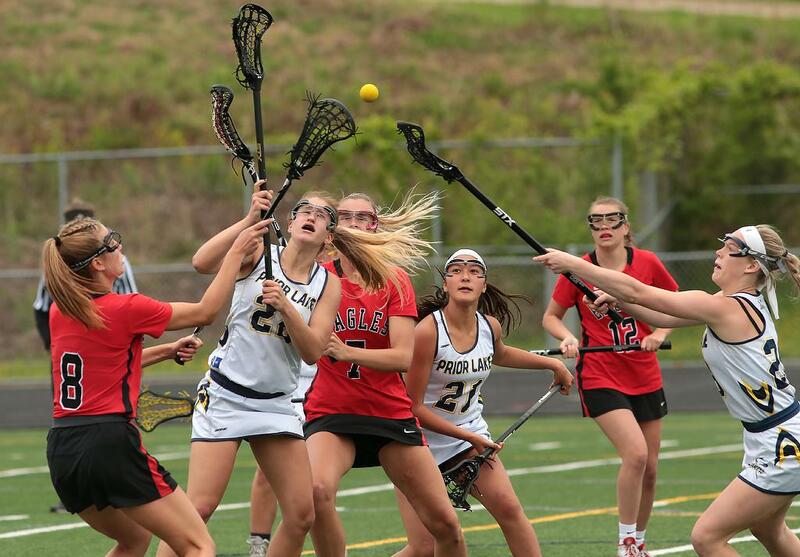 The Prior Lake girls’ lacrosse team ended Eden Prairie’s historic unbeaten run against Minnesota State High School League competition with a 6-5 win over the three-time defending state champions at Prior Lake High School on Saturday afternoon. Eden Prairie, ranked No. 1 in the state coaches’ poll, found itself down 1-0 in the third minute of the opening half. Ashtyn King scored unassisted to give the Lakers an early advantage. The Eagles (10-2, 8-0) responded quickly with a goal from their leading scorer, Brooke Lewis, to tie the game, then Kacie Riggs tallied another for Eden Prairie to give the Eagles a 2-1 lead going into halftime. Strong defense from both teams made scoring difficult throughout the first half. Emilie Bloyer made four saves for Eden Prairie and Grace Mattox had three for Prior Lake. Mattox continued to make key saves in the second half, finishing the game with seven saves. The Eagles looked like they would pull away when they scored two goals early in the second half. However, the Lakers had different plans. Down 4-1, Prior Lake (11-0, 7-0) scored five unanswered goals to go up 6-4 with less than three minutes remaining. Lewis drew one back for Eden Prairie in the final minutes to make it a one-goal game. Lewis led the Eagles and all scorers with three goals. King and Lauren Wick led the Lakers, with each scoring a pair of goals. Before losing to the Lakers, Eden Prairie hadn’t lost to a MSHSL opponent since 2014, when the Eagles fell to Blake in the state championship. All of the Eagles’ losses since then had been in the regular season against Loyola Academy, which is annually one of the most decorated programs in the Midwest and is located in the suburbs of Chicago.